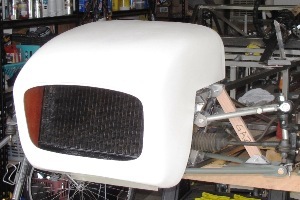 We have bodywork! Yes, I know it's a little early for this since we don't even have the car on its wheels, but our new TTL fiberglass nose from Kinetic Vehicles in Oregon was a birthday gift from my girlfriend, so I couldn't exactly send it back. Besides, you really need to have the nose in place before you build the scuttle, so you can match the angle on the scuttle to the height of the nose. And of course as with many of our descriptions here that makes no sense, but don't worry, it'll all be clear soon enough. Maybe. The most amazing thing about the Kinetic TTL nose it that it fits our Locost perfectly. Unbelievable, really, considering our history. If we'd mounted the radiator an inch higher or half an inch lower, we'd have clearance problems. 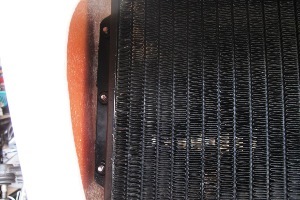 As it is, the inside width of the nose is about a quarter inch wider than the radiator mounting tabs, and the radiator drain valve clears the bottom of the nose by half an inch. Just amazing. My only concern is that we may have used up all our luck for the entire project on this part. But that's actually okay. We really, really wanted the nose to fit. The only trimming we're going to probably have to do is notching either side for the upper shock mounts, and possibly cutting very small notches for the upper suspension pickups. 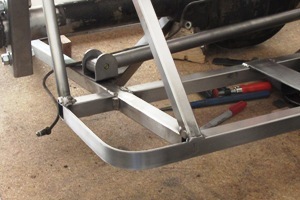 Then we can weld on mounting tabs to the upper frame rails, and install dzus fasteners. Then we're going to paint it. British Racing Green. Again, no doubt extremely premature for us to be painting any bodywork at this point, but we actually have several excellent reasons for doing this, although the only one that really matters is that it'll look cool. Before we do any of that, though, I'm thinking we need to rearrange our priorities. Our bare Locost frame has been sitting out in the elements for awhile now, and of course by "elements" I mean the inside of our garage, which might not be considered the harshest environment imaginable, but it does get hot in there, and a little humid when the dryer's running. We go over the frame every few days with a 3M finishing pad, but the brown spots are increasing in numbers and it's starting to feel like we might be losing the battle. So with all the tasks we need to do to get the car rolling, we've decided we need to prioritize those that require welding stuff to the frame. Once all the welding is done we can get the frame rust-proofed, or at least spray it with WD-40, and put away our 3M finishing pads. Of course 3M will not be happy about this, seeing as how It'll affect their bottom line, but they're big boys and should survive. 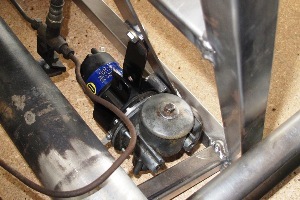 First up on our list of tasks is to mount the fuel pump. The book never mentions a fuel pump, but I'm pretty pretty sure most cars need one, and they have to go somewhere. With nothing else to guide us we decided to mount the fuel pump the same place it was located in the MGB, which is a huge empty space behind the passenger seat that of course doesn't actually exist on our Locost. By chopping down the stock mount and rewelding the tabs, we made it fit, but it's close to everything and doesn't really look like it belongs there. However, I think that's going to describe pretty much everything we add to our Locost from now on. In case I forgot to mention it before, the Locost is a really small car. After we get the fuel tank installed, and the roll bar, and the fuel lines, and the brake lines, and the handbrake cable, there just isn't going to be much room behind the seats, a space that's euphemistically referred to as the "trunk area". In fact, I'm not 100% sure that everything that's supposed to go in there is going to fit. I guess we'll cross that bridge or wade that stream or fire those guns or whatever it is you do when you get there. Next thing we did was finish up the lower rear body mounts. For this project we decided to go with 1/8" steel straps, which is quickly becoming our building material of choice, although sometimes we use 2" wide straps, and sometimes 1-1/2" wide, and in this case 1" wide straps, so it's not like we're stuck on a single width. 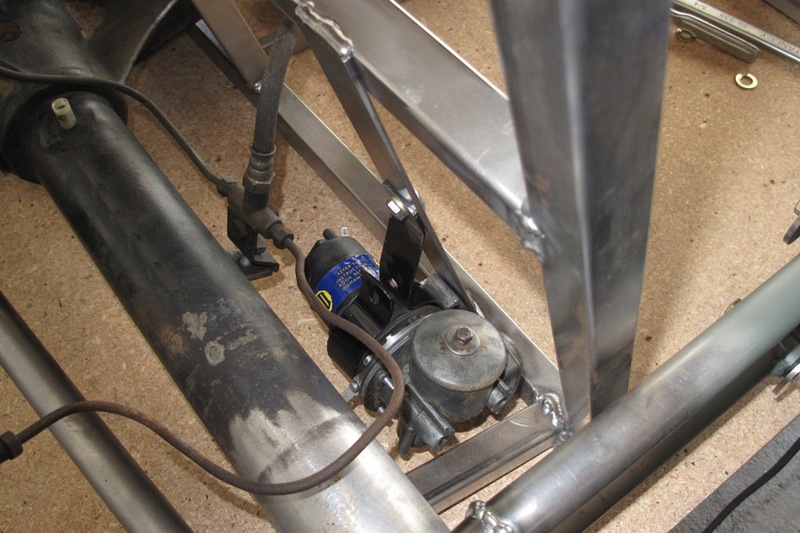 The 1" straps in this case matched up well with the 1" tubing on the back and sides of the frame, and they have the added benefit of providing a level mounting surface for the roll bar support plates. So double bonus points. Next up will be the scuttle frame. If you're not sure what a scuttle is, I think it's one of those obscure British automotive terms like spanner or wrist pin that doesn't always translate directly into English. A scuttle might be something along the lines of what would properly be called a cowl. And for those of you who think English is actually British and they get to make the rules, I'd like to point out that we had a little skirmish with the Brits a few hundred years ago, and if you'll recall, we won. So it's a cowl. But we like the Brits now, and so we'll defer to the book for the purposes of this build log and call it a scuttle. The scuttle frame is pretty simple. Three tubes fit directly over the upper frame rails (P and F tubes). 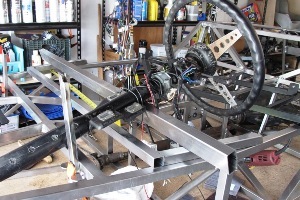 A raised fourth tube then completes the parallelogram and sets up a mounting structure for the steering column. We'll be using a 1"x2" tube for this, with a cutout for the steering column. Later on, the upper firewall will be attached to the front of the frame, the dashboard will be attached to the back, and 20-gauge steel or aluminum sheet will cover the top. The scuttle frame can be welded to the P and F tubes, but we're going to bolt ours on just as soon as we can figure out a way to do that. We have many more welding tasks ahead, but most of them will require flipping the frame around, which we're unlikely to be able to do with everything that's currently attached to itt, like for example the suspension. So the next step after the scuttle install will be to take everything apart. This should be fairly uneventful and so we won't report the actual progress of that here, but we'll be back before it's time to install the engine. Probably way before.